Brenda @ It's A Beautiful Life: Are You Savouring The Countdown? 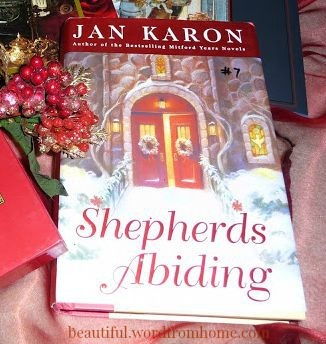 In keeping with the season, I once again pull out Shepherds Abiding by Miss Jan Karon. Although an earnest reader could finish it in a few short hours, I like to turn the pages slowly ... to savor the story. And, let the anticipation that's building up within Father Tim's world create that slow momentum in my own. I don't want to speed through the pages as though I were flying around the world on Santa's sleigh come Christmas Eve. I went in search of the dictionary to see if I could deepen my understanding of the word. Savor means to enjoy and appreciate slowly; to enjoy (a pleasure) for as long as possible. Ah yes... the way a child savors her cup of hot cocoa, especially if it's just before bed. The story lets us peek into what Father Tim is up to during the Advent season. He's working on a time and labor intensive project---a derelict antique Nativity scene complete with the Holy Family, shepherds, sheep, camels, angels---all of which needs to be refurbished before he can offer them as his Christmas gift to Cynthia, his wife. "...blast through an experience without savouring it or later reflecting upon it. For him, working on the figures had slowed him down, forced him to pay attention and to savor the work of his hands ... (because) the time of preparation was yet under way." The process slowed him down and forced him to pay attention... to enjoy the labour of his hands without pressure and impatience. Sometimes I need that reminder. Maybe that's one reason why I love this story so much. Reading Shepherds Abiding has certainly become one of my own little Advent traditions. It's a beautiful way to savor the wonder of this holy season. I love the Mitford series! I am so glad that you reminded me of this book! It is definitely getting time for me to read it again! One of my favourite books, Brenda. Shepherds Abiding is one I come back to, also. How can one not love Father Tim?